A way in which we ensure this is by maintaining a good level of behaviour with clear expectations for all, rewards for good behaviour and sanctions when necessary. This is achieved throughout school in a number of ways. We feel it is important that you, as parents, have a clear understanding of what these expectations, rewards and sanctions are so that you can support us by celebrating your child’s achievements or continuing sanctions at home if necessary. We have 5 Golden Rules that all children are taught when they start with us. They are revisited often through whole school and class assemblies and they are displayed throughout all areas of the school. have kind hands, feet, faces and mouths. take care of everything in and around our school. use listening ears because we have a right to be listened to and helped. be responsible for keeping ourselves and everyone safe. have good manners and respect for each other. It is expected that everyone entering the school follows these rules. Throughout school adults use a number of different ways to encourage children’s good behaviour and reward their achievements. They also use a variety of sanctions if children misbehave. These are detailed below. Some are year group specific and this is to ensure progress over the three years your child is with us so that the rewards and sanctions do not lose their effect. 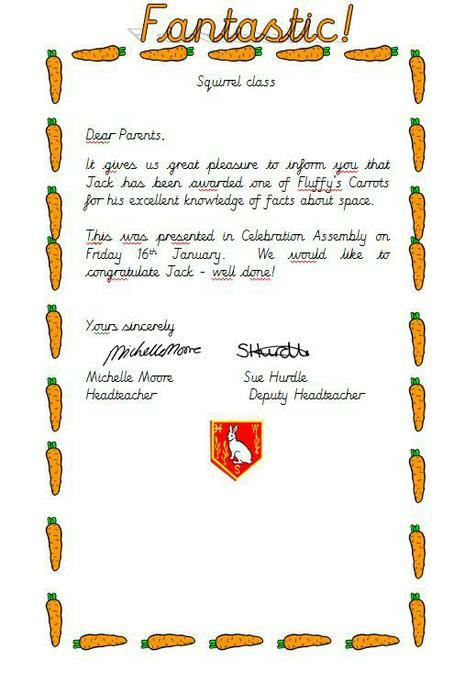 Fluffy’s Carrots – 2 per class weekly chosen by class teacher and are presented in a whole school assembly. Carrots are awarded for a specific achievement that week. Super Six Party – 6 per class per half term chosen by class teacher. This is a reward for children who display a consistently high level of behaviour throughout school during that half term. Lose period of Golden time – in Year 1 children lose 2 minutes then 5 and 10 if necessary and in Year 2 they lose 5 minutes then 10, 15 and 20. Staff speak to parents. If this happens we hope that you would discuss the matter further with your child at home reinforcing the reasons why their behaviour is inappropriate and if necessary implement a further sanction e.g. removal of a toy for the evening. In some cases children in school require a different system for their behaviour management and reward due to personal needs; for example a child may need a sticker reward chart to earn regular rewards during the day. If this is required it is always shared with the parents before it is implemented. Your child may talk about these different systems with you as they can seem unfair. In school we learn how all children are different and may have different needs. It would be appreciated if you could discuss this with your child if they mention such things with you.